The tambur of Khorasan was depicted in Sassanian iconography (third and fourth centuries A.D.) but it goes back much farther than that. 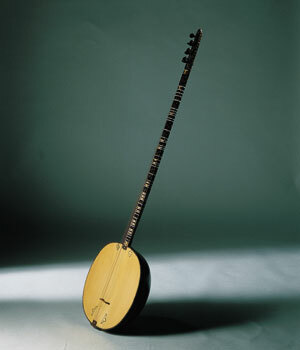 It was probably not much different from the present day Persian tambur used in folk music and at Sufi gatherings. The dutar of Herat has a soundbox similar to the Persian tambur but a longer, thicker neck. Two of the Sufi tambur strings tuned in unison are melody strings; the other is a drone string.